LTTE cheif Vellupillai Prabhakan died after a long war with Srilankan army . It is reported that Prabhakaran died due to suicide.Prabhakaran’s son Balchandran also killed in army attack. Prabhakaran was chief accused of murder of Rajiv Gandhi, former Prime Minister of India . Rajiv Gandhi killed by suicide bomb women of LTTE on 21 May 1991 in Sriperambdur (Tamilnadu, India). It is a co-incident that on 18 May 2009, just after 18 year of murder of Rajiv Gandhi , Prabhakaran killed in attack of Srilankan army. Prabhakaran formed LTTE in 1976. Prabhakaran started war against Government of Sri Lanka. More then 80,000 people including 1255 Indian army, President of Sri Lanka Ranasinghe Premdasa(1993), many ministers of Sri Lanka, thousand of Srilankan army and thousands of tamil and singhal people killed in this long war. Mahindra Rajpakshe elected as President of Sri Lanka in 2005. He taken challenge to clear out LTTE from Sri Lanka. Army of Sri Lanka started final war against LTTE in 2007 under direction and support of Mahindra Rajpakshe , President of Sri Lanka. After use of tanks and bomber planes in war , world’s most wanted terrorist Prabhakaran who was responsible for the story of long painful situation for Srilankans, killed with hundred of his warriors on 18.05.2009. . 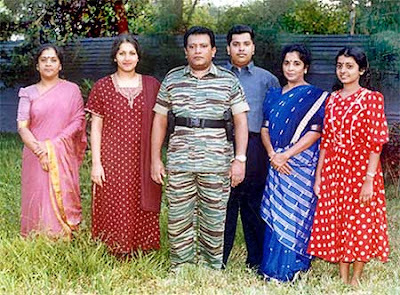 Details of Prabhakaran’s Family – Prabhakaran had a son namned Balachandran was 17-18 year old. Prabhakaran’s wife name is Mathivathani. Prabhakaran has a daughter also . Prabhakaran’s wife and daughter are traceless. It is a full stop for LTTE I think. we wont leave our tamilans there, we will bring back all to tamil nadu as soon as possible!